Early Orthodontics What are the benefits of early orthodontic treatment? When you leave on a trip, you probably double-check that evrything’s ready: your clothes are packed, your ticket is handy, and your passport waits patiently on top of your bag or in a special pocket. The same level of preparedness should apply with regard to caring for your oral health when you’re about to leave home for a while. Whether you’re jumping in the car for a weekend camping trip or flying halfway across the globe for a longer stint, the tips below will help you keep your teeth healthy whil you’re away. The key to maintaining good oral hygiene during travel is preparation. Schedule a regular dental appointment so your teeth are freshly cleaned and ready before you leave. This can identify potential issues that might cause problems while you’re away. If you have any items on a dental “to-do” list, such as wisdom tooth removal, replacement of a filling, or orthodontic adjustment, it’s a good idea to get those procedures completed before your trip. If you’re stuck on a long flight or trekking far into the woods, you might find yourself where there’s no sink or even a toothbrush at hand. We speak for everyone when we say that nothing is worse than a mouth that feels, shall we say, less than fresh. A lemon wedge or Granny Smith apple slice can help freshen up your breath when you’re in need of a quick fix. Rinsing your mouth thoroughly with water can help to wash away bacteria that causes cavities and reduce that gritty sensation. If you’ve got toothpaste, put a dot on your finger or a damp washcloth to serve as a makeshift toothbrush. Nowadays, travel-sized dental products are available at most grocery stores and pharmacies. You can find travel toothbrushes, mini mouthwashes, and pocket-sized floss to slip into your travel bag. Colgate makes disposable mini-toothbrushes called Wisps that can help you freshen up when you may not have access to a regular toothbrush. Packing a few extra dental supplies may also be a good idea in case one gets damaged or lost. Traveling abroad can expose you to unfamiliar conditions. Some countries have compromised water sources that will make you extremely ill if ingested, even from the tiny amount of water with which you wet your toothbrush. Minimize that risk and keep bottles of water on hand instead for rinsing your mouth and toothbrush. If your toothbrush comes in contact with contaminated water, swapping it out for a new one is the safest option. Storing your toothbrush properly is necessary to prevent bacteria from growing on it. Place your brush in a Ziploc bag when you’re on the go and allow it to breathe once you get to a temporary destination. Traveling near or far should be an enjoyable experience. Dental issues shouldn’t be a source of worry on your vacation. 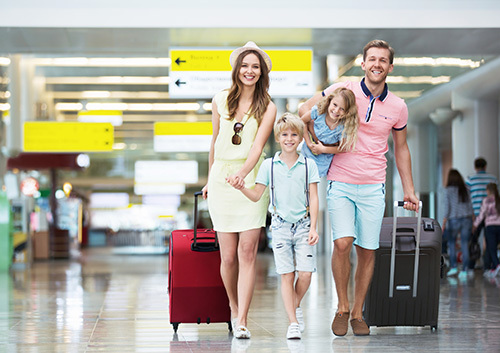 As long as you’re prepared and take precautions, your teeth can stay healthy even when they’re out of the country! Of course, if you have any questions, don’t hesitate to contact our High Point or Greensboro, NC office. Greensboro Office 3300 Battleground Ave.